DPMS A15 AR15 Panther Arms Factory 10 Round Magazines New Takeouts 60730 fit Mossberg MVP Bolt Action Rifles and a whole host of semi autos that take the same magazine Buy 3 Ships Free! Description: This listing is for ONE Magazine. Buy 3, or any 3 of our non gun non ammo items, and shipping is FREE on the entire order, lower 48. 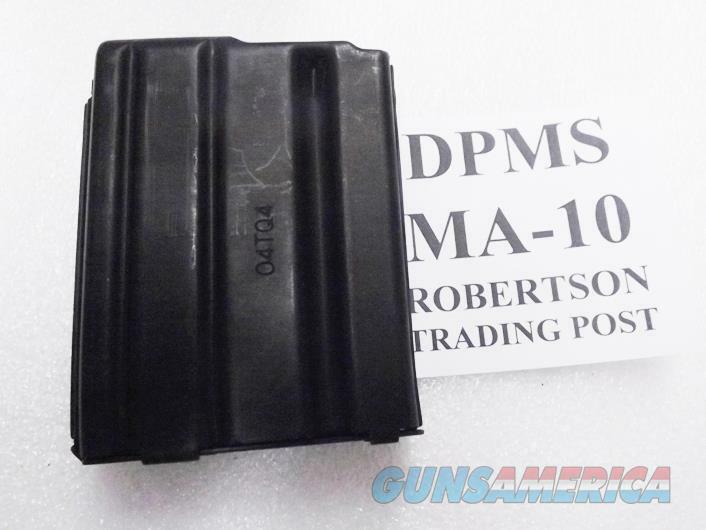 Here are Panther Arms Factory Issue Magazines originally shipped with California Compliant Oracle Rifles to fit any AR15 type rifle. Manufacturer is D&H Industries of Oconomowoc, WI, principal supplier to Defense Procurement Manufacturing Services, also known as Panther Arms, of St. Cloud, MN. Factory order number is MA-10. Construction is black teflon finish serrated side metal alloy body and floorplate, with steel spring and a no tilt green or gray polymer cartridge follower. Each magazine holds 10 rounds of .223 or 5.56 NATO caliber ammunition. These magazines have shipped to us in with brand new CA Compliant Oracle Rifles that we converted to standard with $6.00 worth of parts and subbed Colt magazines for sale in our rifles. All of these MA-10 Magazines are brand new and never fired. They will work not only in the Mossberg MVP Bolt action, but in a whole host of semi autos manufactured by Colt, Remington, Smith & Wesson, Diamondback Arms, Ruger, and many other companies. These will free fall eject from the semis. They will Not work in a Ruger Mini 14, will Not work in a Ruger Scout, will Not work on the door handle of a 1937 Dodge School Bus. They will only work in an AR15 type Semi Automatic Rifle, or in a Mossberg MVP Bolt Action. These are not always easy to come by, like so many products for the past few years. Replacement pricing on dpmsinc com is upwards of $30. We’re offering these new unissued unfired Panther Arms Magazines, however, each	for only	$ 23.00. Not for sale to residents of New York City. Any magazine deliveries into New York City require written permission from the Police Commissioner, so we cannot ship magazines into any of the six boroughs or 176 some odd zip codes, per NYC Code 10-131.10. Connecticut buyers must furnish us a copy of your State Issued Eligibility Permit or Ammunition Certificate, per P.A. 13-220. Any ammunition, firearms, or personnel showing in any of our photos are NOT included.